Here the electrolyte is immobilized as gel. Gel batteries in general have a longer service life and better cycle capacity than AGM batteries. Victron VRLA batteries have exceptional discharge recovery, even after deep or prolonged discharge. Nevertheless repeatedly deep and prolonged discharge has a very negative effect on the service life of all lead acid batteries, Victron batteries are no exception. 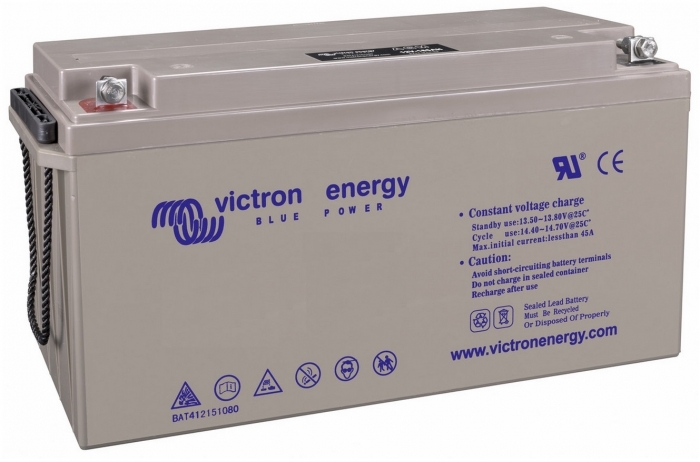 The rated capacity of Victron Gel Deep Cycle batteries refers to 20 hour discharge, in other words: a discharge current of 0,05 C. The rated capacity of Victron Tubular Plate Long Life batteries refers to 10 hours discharge. The effective capacity decreases with increasing discharge current. Please note that the capacity reduction will be even faster in case of a constant power load, such as an inverter. High temperature has a very negative effect on service life.